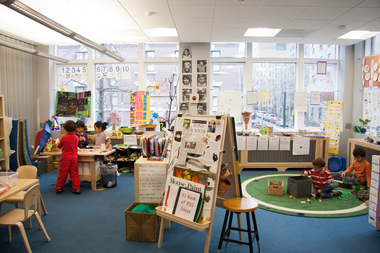 Kids are hard at work at the AltSchool in Brooklyn Heights, which opened last fall. MANHATTAN — A chain of private academies funded in part by Facebook founder Mark Zuckerberg plans to open a school in Union Square, bringing a free-wheeling educational philosophy with a tech-heavy backbone to Manhattan students. AltSchool, which already has one school up and running in Brooklyn Heights and another set to open this fall in the East Village, announced plans to open a new pre-K through eighth-grade school at 14th Street and Fifth Avenue in September 2017. There are about 100 spots open at each school, and tuition will be somewhere below $30,000 per year, a spokesman for the school said. The company, which bills itself as a hybrid tech company and education startup, is the brainchild of a team of Silicon Valley types with a long history in companies like Google, where AltSchool CEO Max Ventilla worked for more than a decade. Combining engineering know-how, a Silicon Valley veteran’s vocabulary and a laid-back educational philosophy, Ventilla and his team managed to get more than $100 million in funding for the schools from Zuckerberg as well as other tech industry heavyweights like Marc Andreessen Horowitz. The goal of the school is not to have kids learning by directly using technology but to have the company’s technology help “curate” each student’s learning process and allow for real-world, project-based learning, Ventilla said. The schools borrow certain philosophical influences from Montessori Schools, focusing on project-based learning and relatively unstructured blocks of time in which kids can work on their own lessons with guidance from teachers or collaborate with other students. The company's software centers around each student’s “playlist,” a to-do list tool that keeps kids on track based on information from their central dashboard. Using this platform, teachers are able follow each child's work, interests, strengths and weaknesses to use to develop an individualized curriculum, Ventilla explained. At an AltSchool in California, three students are working together in Minecraft to build San Francisco city blocks historically realistic to 1906; other kids are building a catapult; and a group of middle schoolers are using data visualization to help them understand and make points about the Iliad. A school day begins with a flexible drop-off time, allowing parents to work around their schedules and preferences. “As the parent of two young kids I know it’s great to be able to get your kid to school within a wider window,” said Ventilla, who plans to send his 4-year-old daughter to an AltSchool in California in the fall. After arrival, students spend time on extracurricular activities or on a personal project. Then after a morning meeting, they launch into a block of time dedicated to work based off their personal “playlist,” which can involve personal projects, group activities, or lessons on core skills. Next comes lunch and athletic time, followed by another block of playlist time. Students who wish to remain past 3 p.m. have the option of three optional blocks of extra-curricular activity time. AltSchool is directly involved in the operation of all the current schools, but the company announced this week plans to allow educators to adopt their technology to independently run schools. That way, someone looking to launch a language immersion school for example, could use AltSchool’s platform but develop their own curriculum and merge their own education philosophy with the technology and worldview of AltSchool, Ventilla said. The East Village school, set to open in September at 1 Avenue B, is currently accepting applications for students, and the company plans to open the Union Square AltSchool in 2017 at 90 Fifth Ave.